Knekoh has been practicing Yoga since 1983 and from her very first class has maintained a steady passion for the practice. This passion has outlasted so many other aspects of her life because as she has evolved, her practice has evolved with her. She’s never felt the need to change her life to practice Yoga, but Yoga has changed her life in one beautiful way after another. One effortless evolution was the joyful discovery of the profound healing aspects of the practice. In 2003 a 56 year old woman, “Patti”, with a 40 year old injury walked into her studio with a shriveled, painful shoulder and the words “my chiropractor says Yoga will help, you’re going to help me”. It was a statement Knekoh couldn’t refuse and boy was Patti right. Both hoped Yoga might diminish the overwhelming pain but to both their amazement, today Patti has full use and function of her arm and has evolved to become a Yoga teacher herself. Impressed with this outcome Knekoh knew she needed to learn more and entered the Yoga Therapy program at Loyola Marymount and literally learned at the feet of some of the world’s modern masters. 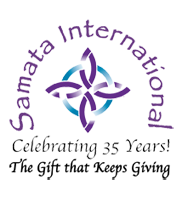 Today she is proudly a YTRx-500c member of Samata Int’l as well as a credentialed Yoga Therapist with the IAYT.